Thursday, February 13 at 7:00 p.m.
Poets and philosophers have long agreed about music’s ability to express the inexpressible. The kinds of music to which they imputed this elevated capability, though, varied widely. By the mid-nineteenth century, the expressive vocabulary of western music was highly developed and well understood; today, though, its subtleties are largely forgotten. As a result, what to us might seem like an evocation of the Infinite might in its own time have been an expression of something far more explicit or even everyday in nature. Thus, musical expressions of the ineffable and thoroughgoingly effable are far closer than we might suspect. Much of music’s ability to reach beyond verbal language, then, is granted by and relies upon the expectations of the listener, rather than being inherent in the music itself. 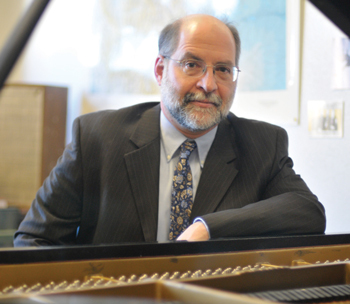 Jonathan D. Bellman is a Professor of Music History and Literature and Head of Academic Studies in Music at the University of Northern Colorado. He earned piano performance degrees from the University of California, Santa Barbara and the University of Illinois, and a Doctor of Musical Arts in Piano Performance Practices at Stanford University in 1990. His most recent book, Chopin’s Polish Ballade: Op. 38 as Narrative of National Martyrdom, was published by Oxford University Press in 2010. His articles have appeared in journals including The Journal of Musicological Research, Musical Quarterly, Nineteenth-Century Music, Early Music, Historical Performance, and The Journal of Musicology. His research interests include musical style in general, musical exoticism, the music and performance practices of Frédéric Chopin, and the concert music of George Gershwin.